A classy, nicely considered build. Look won't be for everyone. Founded by East Londoner Leigh Dovey back in 2010, PJD Guitars is now based in Yorkshire and offers three bolt-on designs - the Carey (single-cut), St John (offset) and Woodford, as we see here. The spec sheet illustrates the small-shop quality with stainless-steel frets, Gotoh hardware, Bare Knuckle pickups and CTS and Switchcraft electronics. All par for the ‘boutique’ course. 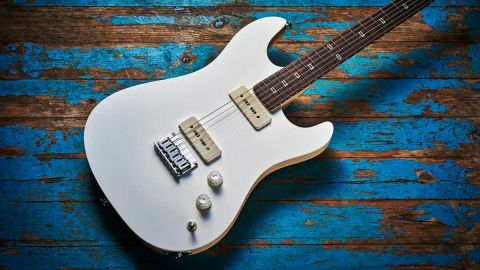 PJD, however, came to our attention via an unusual spin, as the Hybrid range adds a satin acrylic top (and fingerboard inlays), from a choice of some 30 colours. Meanwhile, the “option for design, etchings and inlays are virtually limitless”. Intriguing. Our Woodford prototype clearly illustrates its potential with its modern and clean appearance (the white top reminds us of Yamaha’s futuristic RGX A2), enhanced by the natural lightweight swamp ash body, with classic wavy grain and a bolt-on maple neck. These Hybrid guitars are a no-spray zone - the acrylic top, of course, needs no finish, while the wood body and neck are finished in numerous coats of Tru-Oil (just like Music Man has used for years on its fabulous necks). And, while some modern-style creations can feel as alien as they look, Leigh’s neck-work alone, based on Fender’s 648mm (25.5in) scale length, is superb, combining a mildly compound radius (254- 305mm) rosewood ’board with a ‘standard C’ profile, nicely rounded fingerboard edges and a silky smooth feel. Also, quite rarely, it is a bolt-on, using countersunk Allen-key bolts that locate into inserts in the neck. Hardware is quality (Gotoh) and considered - from the over-sized strap buttons, the string-through brass-saddle hardtail bridge and staggered height, right through to the rear-lock tuners. These clean modern lines are barely interrupted by the pair of Bare Knuckle ’Pig 90s, mounted through the top directly to the body, their soapbar covers adding some ‘players grade’ vibe, with master volume, tone and a three-way toggle selector. The small rear cavity is nicely done too, with foil shielding throughout and a large Bare Knuckle 0.022-microfarad tone cap, while the cover is the same 4.5mm-thick acrylic used for the top. The quality, touring-level feel is everywhere. Overall weight is good at 3.3kg and the at top, with a rear rib-cage cut, throws in a double-cut Tele-like feel. The edges of the top are barely radiused and, on future models, will have more of a chamfer. There is also a slight increase in neck pitch so those saddle-height adjustment screws (which currently slightly protrude from the saddles unless the neck is shimmed) will disappear. at the 1st; 22.2mm at the 12th) with a subtly V’d feel in the lower positions rounding out as you move up. That early Fender-y vibe is helped by thinnish wire, around 2mm wide, with a height of around 1.2mm. It was easy to dial in a low 1.6mm string height, while truss-rod tweaks can be made from the access hole behind the nut. The design has a lovely sustain that rises quickly from the note attack, less percussive than the bolt-on category might suggest. These ’Pig 90s are BK’s “hottest and fattest” soapbars and are based on the Warpig humbucker, while “the colossal output of the ’Pig 90 is derived from a pair of custom-size Alnico V bar magnets and scatter-wound coils of 45 AWG wire”. They might be designed for overdrive - and lots of it - yet while they have a pretty rounded high-end, the neat thing here is they clean up very well. While there is no treble bleed circuit, as you pull down the volume, it creates a wider range of sounds than you’d expect. Leigh favours Bare Knuckle and other UK makers such as The Creamery but, really, the choice is yours. Does the acrylic top change our sonic world? No, but it doesn’t have any adverse effect either. Overall, there’s an enviable clean ring and smooth sustain here that we certainly don’t always hear from every bolt-on that comes through our hands. It’s not the only electric we’ve encountered that uses plastic, however here it offers aesthetic potential, while also creating a clean modern vibe that’s in tune with the build and design. It’s a classy, nicely considered build. Leigh Dovey is one to keep an eye on and we look forward to featuring more PJD guitars in the future.